A raw food diet can work pretty much anywhere. Even if you're a frequent world traveler, with a little planning even long plane rides and unhealthy terminal food aren't big obstacles. I've been moving around a lot over the last 15 months -six countries and multiple cities within those countries - and I often arrive in a new city thinking to myself, 'man, I wish I knew where the best fruit market/supermarket/wholesaler is here." Often there's little info on the internet because, when it comes to picking out fruit and buying it in the quantities required on a raw food diet, most people are clueless and their advice may not be worth much. 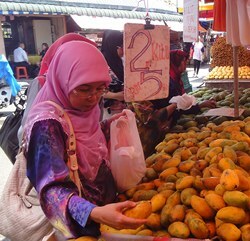 I just returned from a 5-day stop in Kuala Lumpur, Malaysia, and I thought I'd add to my periodic series on fruit buying in foreign locations. Lucky for my stomach, I discovered Chow Kit wet market after a few days of overpriced, unripe fruit. To read my review of the market and find out how to get there, check out this article. 1) Lochana wants to know if a raw food diet will work in the hectic modern world. I let her know here.